In almost any kind of setting, unwanted noise, which includes anything from redundant internal echoes to traffic sounds, can act as a major nuisance. The solution to fight noise and bolster the calmness in your space is by adding acoustic insulation in your home – from the walls to the ceilings. There are various types of acoustic insulation designed to dissipate, deflect and absorb noise to help maintain sound levels at a more manageable degree. Considered as an effective material for sound insulation, gypsum wall and ceiling panels are capable of reducing the amount of noise that travels from room to room. A single layer of gypsum blocks a decent amount of sound, but multiple layers of gypsum improves its ability to control sound even further. For instance, multiplying the thickness of a gypsum wall by two decreases sound transmission travelling through the wall by 6 decibels. Putting a second layer of drywall to a standard framed wall expands the sound transmission coefficient by 11, which prevents almost all types of loud conversations from piercing through the wall. Do you want to take your sound control to the next level? Search for special gypsum wall panels or lead-line drywall that are designed for sound-control applications. Acoustic panels are designed to soak up sound waves instead of blocking sound transfer from travelling between rooms. These panels usually consist of gypsum or mineral fiber cores that are wrapped in a fabric or decorative vinyl cover. Aside from that, they have the ability to absorb up to 95% of sound when they are used as stand-alone partitions, suspended from a ceiling, or hung on a wall. They are often utilized in conference spaces or cafeterias to reduce noise levels and in performance halls and recording studios to enhance sound quality. 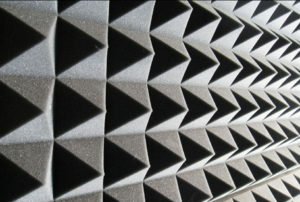 Known for working similarly to acoustic panels, foam egg crate panels are also used in most of the same applications. Another effective type of acoustic insulation are simple compressed straw panels with kraft paper facing. Do you know about the rolls of fiberglass and mineral fiber insulation that are commonly utilized to prevent thermal transfer throughout the walls of a structure? They also function as a type of acoustic insulation. Made from finely spun fibers of cotton, rock, or glass, these rolls can be installed inside of roof or floor framing or between wall studs to aid in managing noise levels. Blankets enhance acoustic performance of a wall or other surface by both increasing the structure’s density and absorbing sound waves. But despite what many people think, insulation blankets packing the highest density are not automatically the best type of acoustic insulation. For ideal noise control, a leading insulation company recommends using blankets with a density of anywhere between 2.5 to 3.0 pounds per cubic foot. This is because blankets with a high level of density can block high-frequency noise more effectively, and noise control with lower frequencies tend to degrade above this density level. Blankets that have a level of density lower than this point may have trouble blocking high-frequency sounds. When it comes to helping noise control transfer from room to room, one of the best solutions is to add a viscoelastic layer between two rigid layers of cement board, plywood or drywall. These products, which share similarities to caulk, are capable of reducing noise transmission by 10 to 20 decibels, which they do by absorbing the mechanical energy of noise vibration and converting it into heat.